Click on an FAQ to reveal the answer. If your question is not answered here, please contact us. 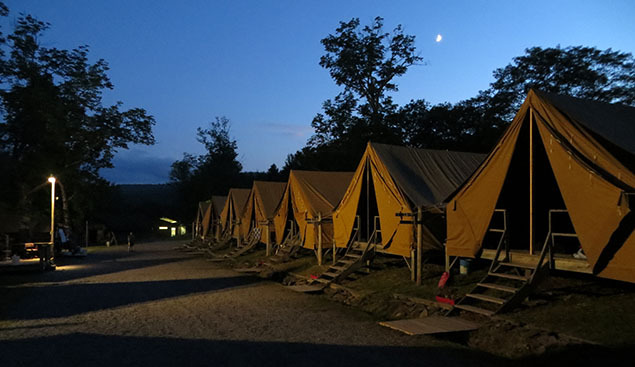 LDBC, a sleep away summer camp, offers your son an amazing summer of fun filled experiences and personal growth that will help him meet life’s challenges. The Camp Directors, Jim and Sue Adams, have spent over twenty-five years running a safe and fun program, which is well known in the American Camping Community. The Gerry family, which founded LDBC in 1909, continues to be actively involved in its operation. LDBC’s program is based on an academy structure where campers have the opportunity to lead and grow from that experience. Spiritual growth, a cornerstone of camp life, takes place in St. Joseph’s Chapel, where our chaplain conducts services in the Episcopal tradition, and at our Outdoor Chapel, a beautiful setting for an informal worship service. During the five-week season, from early July through mid-August, your son will have a fun, safe experience while strengthening values of leadership, discipline, and good sportsmanship. Upon graduation he joins the larger LDBC community, led by the Lake Delaware Alumni Association, which provides a lifetime of meaningful fellowship. Generations of men have found their time at LDBC to be a cherished part of their lives, inspiring them to return each year to donate time and treasure to improve the Camp. Apply online, download and mail the PDF, or by calling the Camp secretary at (607) 832-4451 or Camp directors James and Sue Adams at (315) 789-4910. You may send a check to Lake Delaware Boys Camp, P.O. Box 31, Delhi, NY 13753. You may donate online through this website. You may make a planned gift and join the LDBC Emblem Society. Can I (a parent) or Grad visit? Parents, Alumni, and other interested persons are invited to visit camp on Parents/Grads Weekend and the Final Weekend of the Camp season. Please restrict visits to these times. Since its beginning, LDBC has been committed to serving a fresh, wholesome, well-rounded diet. The combination of nutritious meals and lots of exercise and activity leaves our campers and counsellors strong and fit at the end of the summer. Meals are served family style and there is limited ability for special dietary needs. Who should apply to attend the camp? A boy who would like to have a summer filled with fun, friendships, and personal growth in a safe, wholesome and supportive environment. A boy who is ready for high adventure and activity. A boy who loves sports, swimming, nature, hiking, music, crafts, and adventure activities. A boy who is ready for the challenge of our academy style program, and for the leadership skills it teaches. A boy who would enjoy the peace and inspiration of our daily Chapel service. How do I communicate with my son? Campers are required to write letters home at least twice a week during the camp season. Campers LOVE receiving mail; so parents write often! Campers do not have access to the internet.